Quality Grading becomes a very important matter in modern slaughterhouses. 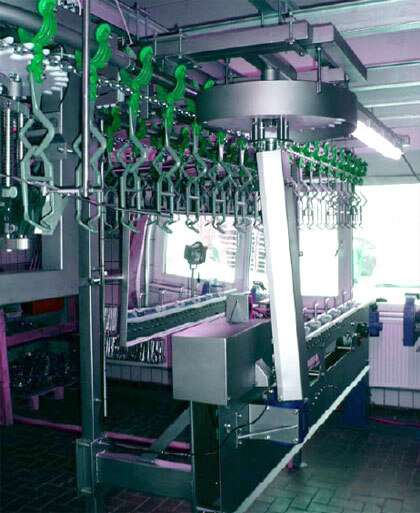 The Quality Selector can be installed whether in the chilling or in the weighing line and gives an economic work station for the operating staff. By pre-selecting the birds into 3 quality grades a simple and reliable selection of the birds is provided. In connection with the Weighing Line, it is possible exactly to drop the birds at any point required. Whether it is an A, B or C quality grade. The machine entirely is made of stainless steel and other non-rusting components. The machine is available in several sizes in order to fit the plant capacities. The complete unit comprises the base frame with an endless conveyor and the relating selector switches which are in parallel position to the relating shackle of the overhead conveyor. The drive is effected by a direct connection to the overhead conveyor. Further the grader is completed by an oversized mirror and a waterproof working place lamp.